Ohio Buckeye Boys State Governor Blaise Tayese of Washington Court House speaks to the Kiwanis Club about his election as Governor and his experience at Buckeye Boys State. WILMINGTON — The Wilmington Kiwanis Club which meets at noon recently acknowledged the efforts of those that had been members for at least 20 years with a Legion of Honor certificate from Kiwanis International. These members have accumulated more than 300 years to the cause of helping children in Clinton County and beyond. They are Robert “Bob” Curtis, Vermon L. Dillon, Craig Edgington, Mack Fife, Keith Gerritz, Walter Hank, Chris Hansen, Fred Matthews and Roger Meredith. Receiving special accolades was Walter Hank, who has been a Kiwanis member for 50 years. The guest speaker for the event was the Governor of Ohio Buckeye Boys State, Blaise Tayese, from Washington High School in Washington Court House. The club inducted a new member, Judy Mills. The club also celebrated their most recent Literacy Service Project in conjunction with Faith Lutheran Church’s Food Pantry. For over a year, the club has donated books for children visiting the food pantry. To date, more than 700 books have been donated. 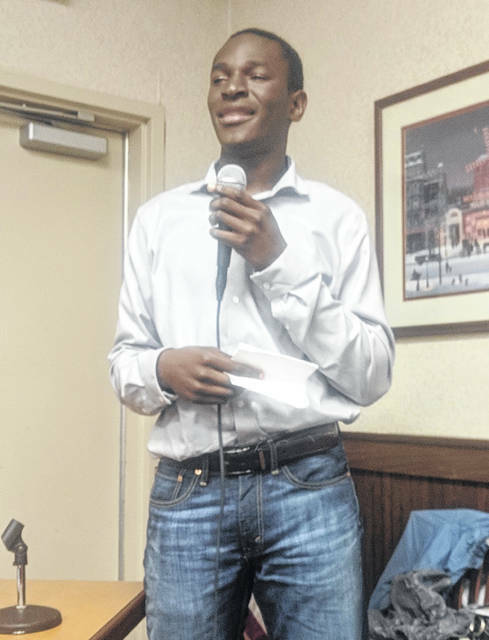 https://www.recordherald.com/wp-content/uploads/sites/27/2018/08/web1_kiwanis-3.jpgOhio Buckeye Boys State Governor Blaise Tayese of Washington Court House speaks to the Kiwanis Club about his election as Governor and his experience at Buckeye Boys State.